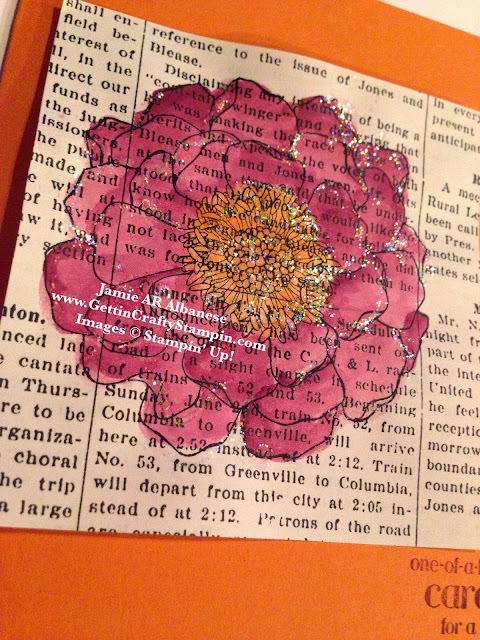 Create a unique and pretty card that resembles popular mixed media art. Using a few steps you can create this stunning water-colored, hand-stamped card that is sure to delight. So enjoy being an artist without drawing a line thanks to our award winning rubber stamps and crafting tools. 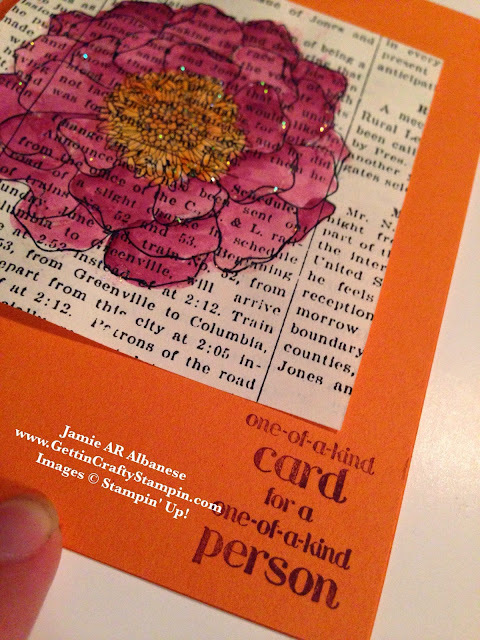 I love this look of stamping over an image. The Typeset Designer Series Paper is a Specialty Paper that is thin but strong and resembles a vintage press! It is ideal to stamp on and watercolor, giving a slight wave to the paper, for a cool look. Stamp the Blended Blossom image using the Jet Black Stazon ink pad. Thanks to my Color Coach - it's paired the Rich Razzleberry and Pumpkin Pie colors for a WOW look! Using the Aqua Painter dipped in the Pumpkin Pie and Rich Razzleberry ink pads (squish the pad into the lid while closed to create a palate of ink and to preserve your ink pad). This painting on the Designer Series Paper will create a rippled look to the page - I love this look. *Pick A Pack (well, 6 packs!!) 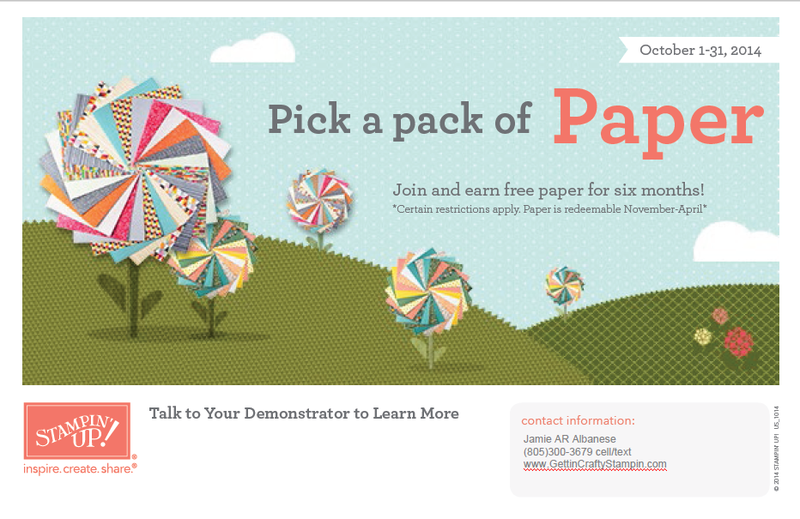 of FREE Designer Series Paper! See the AMAZING DEAL when you Click Here! Stamping this cute sentiment that will cheer your loved one is easy using the Rich Razzleberry ink pad on the Pumpkin Pie card stock. The fine tip on the Dazzling Details Glitter Adhesive will follow the line of your stamped and colored image. Squeeze a little and drag around the image to add a sweet sparkle to your image. 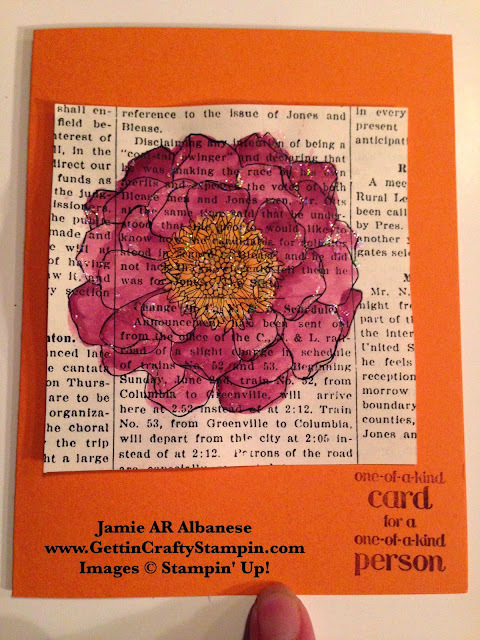 Using the Stampin' Dimensionals (here I used four). Adhere to the back of the painted image toward the middle. This will allow the page to have the slight ripple yet stay in place. 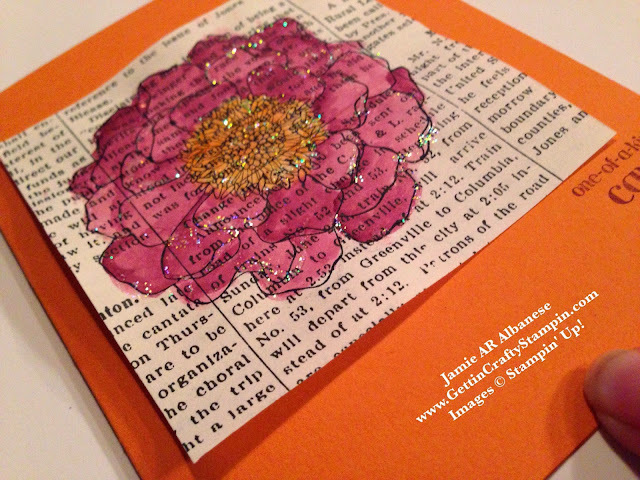 Send color, sparkle and art in one hand-stamped card! This cool watercolor technique is fun and easy to do while making a big impact. 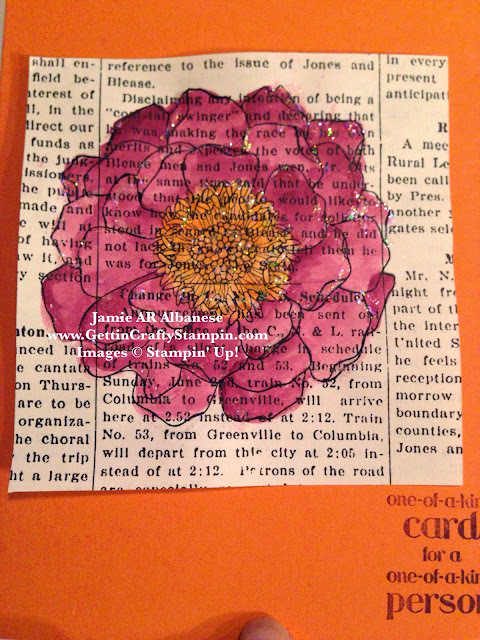 You don't have to draw a line to create a cool mixed media art look with your hand-stamped card! A hand-crafted card is sure to delight and bless for a long time. This trendy art is fun and sure to stand the test of time - have fun with it!